I am a natural dyer, weaver, and spinner living and working in the Connecticut River Valley of Western Massachusetts. This is my blog. My first exposure to weaving was during a youth summer program that same year at Horizons (now Snow Farm) in Williamsburg, MA. I also took studio art classes in a variety of media in high school and college, and cultivated my skills as a potter. I then focused on religious studies, philosophy, and other academic pursuits for several years. As the millennium drew to a close, a growing desire to learn the fundamental skills of making cloth drew me to spinning in 1999. In the spring of 2000, I took a weaving class with Susan Loring Wells, and began my natural dye experiments in earnest that fall. In 2010 I earned a Master Weaver Certificate from the Hill Institute in Florence, MA, where I had the pleasure and privilege of studying with Chris Hammel, Director of Weaving. In addition to conducting extensive independent research with plant dyes, I have taken workshops with Christine White, Michele Wipplinger, Kathy Hattori, and Joan Morris. I have taught weaving and dyeing to children and adults in Amherst at the (former) Fiber Art Center, The Common School, North Amherst Community Farm, Hampshire College, and in Kara Koo, Kyrgyzstan. I am fascinated by the complex processes by which raw natural materials are transformed into yarn, color, and cloth. In my quest to understand these processes, I garden, gather, dig, dry, ferment, boil, rot, crush, freeze, twist, steam, squeeze, and in many other ways delve deeply into exploring the physical properties of plants and fibers. 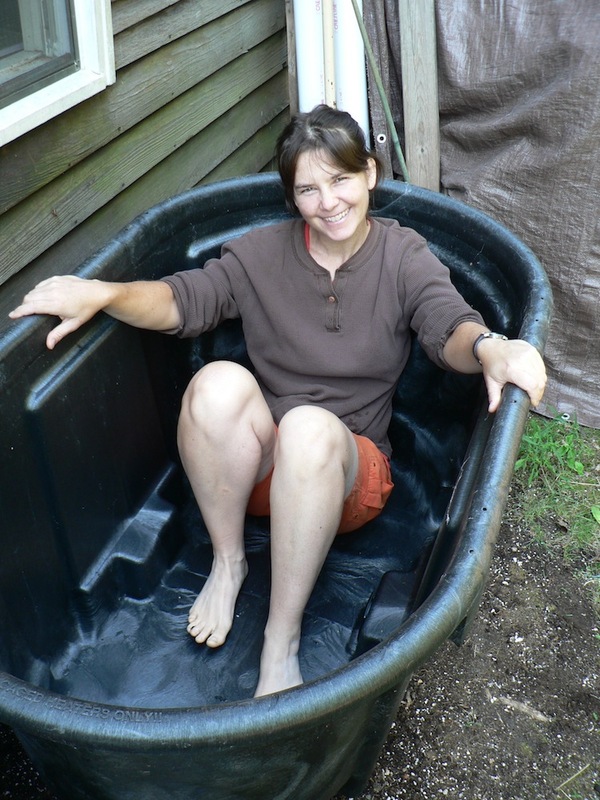 My particular passion is to understand and utilize the materials that can be grown and gathered locally, in the Connecticut River Valley and surrounding hills, and to support organic and sustainable cultivation and processing methods. I aspire to create local cloth, while connecting to sources of sustainably produced materials around the world. All cloth is slow cloth. Making cloth is labor intensive. Cloth is ubiquitous. It is a necessity but we must not take it for granted. Just as we want to know where our food comes from or who our farmer is, we should ask where our cloth comes from, who makes it, and under what conditions. Where did the raw materials come from and where did the waste go? Are the true costs of its production reflected in the price we pay? To me, weaving, spinning, and dyeing are processes that are practical and empowering, yet also depend on external factors. They are individual and collective pursuits, magical and alchemical, quantifiable and intuitive, physically exhausting, intellectually challenging, and inspirational. Also, they are a lot of fun. * A repeat of the pokeberry experiment in 2000, using wool and a mordant this time, yielded a vivid orange, which faded sadly with exposure to light and washing.